Jeff Pryor - Operations Manager of Black Star 231 Corp.
Jim and Jeff Pryor at Black Star 231 Corp. office. 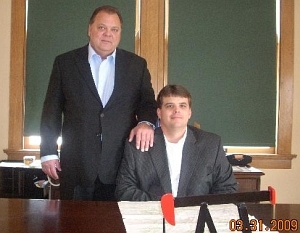 The most gratifying moment in my years in the oil business came the day in July 2008 when my son Jeff joined the company as field engineering/operations manager. 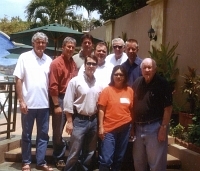 Jeff began helping with field operations while in grade school. 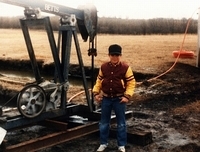 Being naturally talented in mechanical and engineering concepts, Jeff understood even at a young age why and how the oilfield equipment worked. By the time Jeff was in high school, his ability to identify and correct problems with the mechanical equipment was superior to our experienced field personnel. 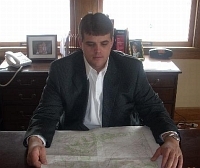 The addition of Jeff to our technical staff adds value to the producing assets of the investors, and the company through his lease/well engineering and design capabilities, and his programs to monitor each wells maintenance, and efficiency for maximize oil production from every well, everyday. 1983: Jeff at the Sinclair # 1, helping his dad at age 10. 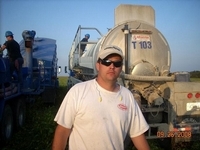 Jeff at the Olson #1, in charge of hydro-frac stimulation at age 35. 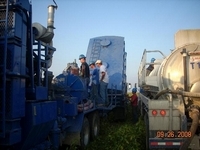 2008: Jeff on the frac platform supervising hydro-frac stimulation for the Olson #1 well, Anderson County, Kansas. 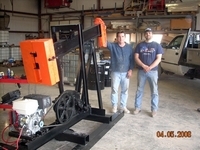 Jeff and Joe working on a pump jack in the shop. Jeff Pryor at Black Star 231 office. 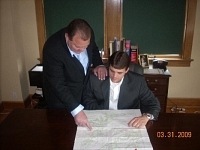 Jeff and his father check a map at the Black Star 231 office.